Throughout the $2 bill's pre-1929 life as a large-sized note, it was issued as a United States Note, National Bank Note, silver certificate, Treasury or "Coin" Note and Federal Reserve Bank Note. When U.S. currency was changed to its current size, the $2 bill was issued only as a United States Note. Production went on until 1966, when the series was discontinued. Ten years passed before the $2 bill was reissued as a Federal Reserve Note with a new reverse design that commemorated the United States Declaration of Independence. As a result of banking policies with businesses which have resulted in low production numbers due to lack of demand, two-dollar bills do not circulate as well as other denominations of U.S. currency. This comparative scarcity in circulation, coupled with a lack of public knowledge that the bill is still in production and circulation, has also inspired urban legends about its authenticity and value and has occasionally created problems for those trying to use the bill to make purchases. The denomination of two dollars was authorized under a congressional act, and first issued in March 1862. The denomination was continuously used until 1966; by this time the United States Note was the only remaining class of U.S. currency the two-dollar bill was assigned to. In August 1966, the Treasury Department discontinued production of all denominations of United States Notes, which included the two-dollar bill. The two-dollar denomination was not immediately reassigned to the Federal Reserve Note class of United States currency and was thus fully discontinued; the Treasury cited the two-dollar note's low use as the reason for not immediately resuming use of the denomination. In 1976, production of the two-dollar denomination was resumed and the two-dollar bill was finally assigned as a Federal Reserve Note, with a new reverse design featuring John Trumbull's depiction of the drafting of the United States Declaration of Independence replacing the previous design of Monticello. It has remained a current denomination since that time. It was estimated that if two-dollar notes replaced approximately half of the one-dollar notes in circulation, the federal government would be able to save about $26 million in 1976 dollars ($114 million adjusted for inflation) over the period from 1976 to 1981, due to reduced production, storage, and shipping costs. However, due to their limited use, two-dollar notes are not printed as frequently in a new series as other denominations, which are produced according to demand. Most bill acceptors found in vending machines, self checkout lanes, transit systems and other automated kiosks are configured to accommodate two-dollar bills, even if the fact is not stated on the label. Although they are generally available at most banks, two-dollar notes are usually not handed out except upon specific request by the customer, and may cause a delay with a trip to the vault. Printing $2 bills is twice as cost-effective for the government as printing $1 bills, since they both cost the same amount (around five cents) to manufacture, but the public has not circulated them as widely. During the Great Depression, few Americans had enough money to require $2 bills. In the middle of the 20th century, $2 bills were often used for betting on horse racing, tips at strip clubs and for bribery when politicians wanted votes (though this is most likely urban legend), and so acquired a negative reputation. Servicemen during World War II and later, were frequently paid with $2 bills, and the notes often saw use at canteens, post exchanges USO clubs and commissaries. Many people erroneously believe that the 1976 series note with its unusual reverse design was a special, limited issue, produced for the United States Bicentennial; This, combined with the earlier discontinuation of the denomination, gave the impression these notes might be valuable as collector's items, and contributed to hoarding. Today, the general public is still largely unfamiliar with the notes because they are not widely circulated and continue to be frequently hoarded. There remains a common misconception that the $2 bill is no longer being produced, though bills have been printed with series dates of 1976, 1995, 2003, 2003A, 2009, and 2013. A series changes when there is a redesign of the bill or changes in signatory; Secretary of the Treasury or Treasurer of the United States. The U.S. treasury reports that $1,549,052,714 worth of $2 bills were in circulation worldwide as of April 30, 2007. Things such as unusual serial numbers (example: A11111111A), and replacement notes designated by a star in the serial number can raise the collector value. "Collectible" or "enhanced" two-dollar bills, commemorating America's national parks and other places and events, have been made and sold by coin dealers and others in recent years merely by adding color, special graphics or color printed plastic overlays onto regular issue two-dollar bills by using computer printers. 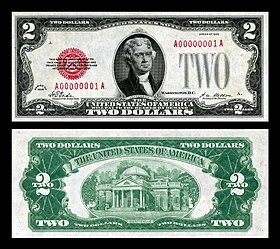 The creators and marketers of some of these bills unscrupulously imply that they are authorized or issued by the federal government; however, these "collectible" or "enhanced" two-dollar bills are not authorized by the Bureau of Engraving and Printing (BEP) nor any other government agency and are not worth anything more than their $2 face value on the collectors' market. Certain conventions and tourism/convention bureaus capitalize on the scarcity of $2 bills in circulation, encouraging convention attendees and tourists to spend $2 bills in order to illustrate to the host communities the economic impact that the conventions and tourism bring. Sometimes known as "SpendTom" campaigns, the $2 bills linger in the community as a constant reminder. Some campaigns encourage people to participate in a hunt for the bills in order to win prizes. Series 1890 featuring James McPherson. This "Coin Note" was used for government purchases of silver bullion from the mining industry. In March 1862, the first $2 bill was issued as a Legal Tender Note (United States Note) with a portrait of Alexander Hamilton; the portrait of Hamilton used was a profile view, different from the familiar portrait in use on the small-sized $10 bill since 1928. By 1869, the $2 United States Note was redesigned with the now-familiar portrait of Thomas Jefferson to the left and a vignette of the United States Capitol in the center of the obverse. This note also featured green tinting on the top and left side of the obverse. Although this note is technically a United States Note, TREASURY NOTE appeared on it instead of UNITED STATES NOTE. The reverse was completely redesigned. This series was again revised in 1874; changes on the obverse included removing the green tinting, adding a red floral design around WASHINGTON D.C., and changing the term TREASURY NOTE to UNITED STATES NOTE. The 1874 design was also issued as Series of 1875 and 1878, and by 1880, the red floral design around WASHINGTON D.C. on the United States Note was removed and the serial numbers were changed to blue. This note with the red floral design was also issued as Series of 1917 but with red serial numbers by that time. National Bank Notes were issued in 1875 and feature a woman unfurling a flag and a big 2 (Lazy Duce) on the obverse. The reverse has the king of England smoking tobacco and an eagle with a shield. In 1886, the first $2 silver certificate with a portrait of United States Civil War General Winfield Scott Hancock on the left of the obverse was issued. This design continued until 1891 when a new $2 Silver Certificate was issued with a portrait of U.S. Treasury Secretary William Windom in the center of the obverse. Two-dollar Treasury, or "Coin", Notes were first issued for government purchases of silver bullion in 1890 from the silver mining industry. The reverse featured large wording of TWO in the center and a numeral 2 to the right surrounded by an ornate design that occupied almost the entire note. In 1891, the reverse of the Series of 1890 Treasury Note was redesigned because the treasury felt that it was too "busy", making it too easy to counterfeit. More open space was incorporated into the new design. In 1896, the "Educational Series" Silver Certificate was issued. The entire obverse of the note was covered in artwork with an allegorical figure of science presenting steam and electricity to commerce and manufacture. The reverse of the note featured portraits of Robert Fulton and Samuel F. B. Morse surrounded by an ornate design that occupied almost the entire note. By 1899, however, The $2 Silver Certificate was redesigned with a small portrait of George Washington surrounded by allegorical figures representing agriculture and mechanics. The final design of the United States' silver certificate series featuring George Washington, printed in 1899. Large-sized Federal Reserve Bank Notes were issued in 1918. Each note was an obligation of the issuing Federal Reserve Bank and could only be redeemed at the corresponding bank. The obverse of the note featured a borderless portrait of Thomas Jefferson to left and wording in the entire center. The reverse featured a World War I battleship. Beginning in the 1950s, production of $2 bills began to decrease. The relative scarcity of the bills led some to start saving any they found, with the inevitable result that the notes became rarer in circulation. Currently, the circulation of $2 bills accounts for around 1% of the U.S. currency in circulation. In 1928, when all U.S. currency was changed to its current size, the $2 bill was issued only as a United States Note. The obverse featured a cropped version of Thomas Jefferson's portrait that had been on previous $2 bills. The reverse featured Jefferson's home, Monticello. As with all United States Notes the treasury seal and serial numbers were red. 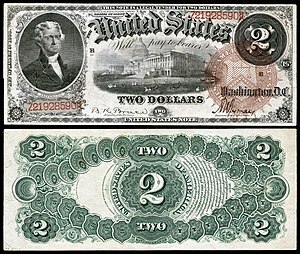 The Series of 1928 $2 bill featured the treasury seal superimposed by the United States Note obligation to the left and a large gray TWO to the right. In 1953, the $2 bill along with the $5 United States Note received minor design changes. The treasury seal was made smaller and moved to the right side of the bill; it was superimposed over the gray word TWO. The United States Note obligation now became superimposed over a gray numeral 2. The reverse remained unchanged. The final change to $2 United States Notes came in 1963 when the motto IN GOD WE TRUST was added to the reverse over the Monticello. Further, because silver certificates were soon to be no longer redeemable in silver, WILL PAY TO THE BEARER ON DEMAND was removed from the obverse. In August 1966, all current denominations of United States Notes ($2, $5 and $100) were officially discontinued, though they all remain legal tender. Series 1976 first day of issue $2 note with a canceled JFK postage stamp. On April 13, 1976, the Treasury Department reissued the $2 note as a cost-saving measure. Series 1976 $2 bills were redesigned as a Federal Reserve Note. The note retains the same portrait of Jefferson, and the basic design of the obverse remains unchanged since 1928. The treasury seal and serial numbers are printed in green ink, replacing the red used on the previous United States Note. Since the reintroduction of the note coincided with the United States Bicentennial, it was decided to use a bicentennial-themed design on the reverse. Contrary to wide belief, the bill was not issued specifically to celebrate the bicenntenial. An engraved rendition (not an exact reproduction) of John Trumbull's Declaration of Independence replaced Monticello on the reverse. First-day issues of the new $2 bills could be taken to a post office and stamped with the date "APR 13 1976". In all, 590,720,000 notes from Series 1976 were printed. Currently, stamped series 1976 $2 notes typically trade for about twice their face value. If the bills were stamped in a city with an unusual name, the value may be slightly higher. However, no first-day-issued 1976 $2 bills with postage stamps are especially rare or valuable. Despite their age, crisp, uncirculated series 1976 $2 notes are not uncommon and are not particularly valuable. More than half a billion of these notes were printed and a large number of them were saved and hoarded upon their original issue. A typical, single uncirculated 1976 $2 bill is worth only slightly above $2 face value. An average circulated series 1976 note has no value other than its $2 face. In 1996 and 1997, 153,600,000 bills were printed as Series 1995 for the Federal Reserve District of Atlanta. In 2004, 121,600,000 of the Series 2003 bills were printed for the Minneapolis Federal Reserve Bank. An issue of Series 2003A $2 bills was printed from July to September 2006 for all twelve Federal Reserve Banks. In all, 220,800,000 notes were printed. In February 2012, the B.E.P. printed 512,000 Series 2009 $2 Star Notes, in anticipation of more regular runs being printed later in 2012. Series 2009 $2 bills were issued to banks during the summer of 2012. In November 2013, the B.E.P. began printing series 2013 $2 notes for the Federal Reserve Bank of Atlanta; these notes entered circulation in early 2014. A total of 44,800,000 notes were ordered for fiscal year 2014, which ran from October 2013 through September 2014. Legal Tender Note 1862 Lucius E. Chittenden F.E. Spinner Small Red w/rays Also called a "Greenback". red, white, and blue colors. of the "2" on the note. Silver Certificate 1896 Tillman & Bruce Morgan & Roberts Small Red w/rays Part of the "Educational Series". ^α These are sourced by The Official Red Book (Whitman). A chronological display of the American two-dollar bill. Visual collection of the two-dollar bill throughout the history of the United States. Over five million $2 bills are entered into the database of the American currency-tracking website Where's George?. Because $2 bills are uncommon in daily use, their use can make a particular group of spenders visible. A documented case of using two-dollar bills to send a message to a community is the case of Geneva Steel and the communities in the surrounding Utah County. In 1989, Geneva Steel paid its employee bonuses in $2 bills. When the bills began to appear in different places, people recognized the importance of the company to the local economy. Use of the two-dollar bill is also being suggested by some gun rights activists to show support for Second Amendment rights, particularly at stores that allow open carry or concealed carry of weapons on their premises. Two-dollar notes have also seen increased usage in situations where tipping is encouraged, especially in gentlemen's clubs. This is due to the idea that tips will increase because of the ease of use of a single, higher-denomination bill as the lowest common note in use. The use of the two-dollar bill is popular among fans and alumni of Clemson University, who often bring notes with them when traveling to university athletic events in other localities as a demonstration of their economic impact in an area. The idea was first popularized in 1977 when Georgia Tech had threatened no longer to play the Tigers in football and has since caught on as a token of fandom when traveling to other locations. Fans will often stamp an orange tiger paw (Clemson's logo) on the note as a sign of its origin. During the 1930s, the $2 bill was often used at East Coast horse race tracks to make a bet. Because of the German and Jewish influence, the bill was locally known in parts of New Jersey as a "zwei-buck", and the upper right corner "2" was sometimes torn off to increase the luck. In the town of Valentine, Nebraska, the local grocery store, Henderson's IGA, stocks their tills with $2 bills and hand them out as change. It's a free marketing ploy, as the rarity of it causes people to talk about the store. The relative scarcity of the $2 bill in everyday circulation has led to confusion at points of sale, as well as overreaction and prosecution of the individual attempting to tender the bill. In 2005, a man in Baltimore, Maryland, was jailed for attempting to use $2 bills to pay a car stereo installation fee that Best Buy originally agreed to waive in the first place. In 2016, a 13-year-old girl in Texas was detained by police at Fort Bend Independent School District's Christa McAuliffe Middle School and prevented from eating lunch that day for attempting to use an old $2 bill to pay for her lunch in the school cafeteria. The bill, from 1953, was so old that the school's counterfeit pen did not work on it. Uncut currency delivery from BEP. Uncut currency sheets are available from the Bureau of Engraving and Printing. Some of the recent $2 uncut sheets from Series 1995 and Series 2003 have been collectibles as they come from special non-circulation printings. Most of the Series 1995 $2 uncut sheets had a higher suffix letter in the serial number than regular circulation $2 bills. Uncut $2 sheets from Series 2003 were printed for the Boston (A), New York (B), Atlanta (F), Chicago (G), Minneapolis (I), and Dallas (K) Federal Reserve districts despite the fact that notes from the Minneapolis district were the only ones released for circulation. Uncut sheets of Series 2003A have also been produced, although in this case circulating currency for all districts has also been made. All two-dollar bills beginning with Series 1995 have been printed in the BEP facility in Fort Worth, Texas, (indicated by "FW" preceding the face plate number on the obverse of the note). Tipping $2 uncut currency at Starbucks. Two-Dollar Bill Challenge - Spend only two dollar bills for an entire month. Uncut sheets of $2 bills are available in various sizes. A 32-subject sheet, which is the original-size sheet on which the notes are printed, is available. Other sheet sizes available have been cut from the original 32-subject sheet. These include half (sixteen-note), quarter (eight-note), and eighth (four-note) sheets for $2 bills. Uncut sheets are sold for more than their respective face values. Uncut sheets of large size notes (issued before 1928) also exist, but are extremely rare. ^ "Legal Tender Alexander Hamilton: 1862 $2 Currency". The Kennedy Mint. Retrieved February 9, 2011. ^ "Six Kinds of United States Paper Currency". friesian.com. Retrieved February 9, 2011. ^ "About Paper Money - Small-size Bicentennial $2 notes". Coinworld.com. Archived from the original on February 7, 2011. Retrieved February 9, 2011. ^ Stone, Suzanne J. (March – April 1976). "The $2 Bill Returns" (PDF). The Economic Review. Federal Reserve Bank of Richmond. 62 (2). Retrieved December 21, 2014. ^ "$2.00 still printed?". Ustreas.gov. Archived from the original on July 25, 2010. Retrieved July 27, 2010. ^ "$2 accepting vending machines". 4mega-vending.com. Archived from the original on July 5, 2002. Retrieved February 9, 2011. ^ "Use The $2". Retrieved October 30, 2008. ^ Why are there so few $2 bills? ^ a b "FAQs: Denominations of currency". United States Department of the Treasury. Retrieved August 25, 2014. ^ bbbconsumeralert (January 27, 2010). "Sometimes a $2 Bill is Just a $2 Bill". Tucson Citizen.com. Retrieved February 9, 2011. ^ "Spend Tom 2010". Visit California. January 1, 2010. Retrieved February 17, 2014. ^ Stone, Suzanne J. (March – April 1976). "The $2 Bill Returns". Retrieved February 9, 2011. ^ Bureau of Engraving and Printing. "Annual Production Figures". Archived from the original on March 4, 2007. Retrieved April 14, 2007. ^ a b "Series 2003A $2". USpapermoney.info. Retrieved February 9, 2011. ^ "Series 2009 $2". USpapermoney.info. Retrieved April 29, 2012. ^ "2012 BEP Production Info via FOIA". WheresGeorge.com. Retrieved April 29, 2012. ^ "Series 2013 $2". USpapermoney.info. Retrieved February 19, 2014. ^ "1869 $2 Legal Tender Rainbow Note". usrarecurrency.com. Retrieved November 14, 2015. ^ Kathy Lawrence (May 19, 2011). ""Lazy Deuces" — $2 National Bank Notes". currency.ha.com. Retrieved November 14, 2015. ^ Fred Reed (July 29, 2009). "Battleship Note Projects American Naval Strength". numismaster.com. Retrieved November 14, 2015. ^ Arthur L. & Ira S. Friedberg (2014). A guide Book of United States Paper Money 4th Edition. Whitman. pp. 56–68. ^ Tad Walch (May 17, 2003). "Geneva workers give their $2 worth". Deseret News. Retrieved May 30, 2013. ^ "2A supporters start Buycott to battle the Starbucks Anti-Firearm Boycott". Military Times. Retrieved February 15, 2012. ^ "$2 bill increasing in use and shedding its 'play-money' image". USA Today. November 7, 2006. Retrieved February 17, 2011. ^ "Clemson University Traditions". Retrieved October 3, 2016. ^ Olesker, Michael (March 8, 2005). "A tale of customer service, justice and currency as funny as a $2 bill". The Baltimore Sun. Retrieved September 17, 2018. ^ "Lunchroom Lunacy: ISD cops investigate $2 bill spent on school lunch". abc13.com. Retrieved February 27, 2018. ^ "Series 1995 $2". USpapermoney.info. Retrieved February 9, 2011. ^ "Series 2003 $2". USpapermoney.info. Retrieved February 9, 2011. ^ "BEP to Raise Uncut Currency Sheet Prices". coinnews.net. Retrieved July 21, 2012. ^ "Large Size. 1896. Silver Certificates. Bound Presentation Set of the First Educational Uncut Sheets. $1, $2, and $5. Fr-224, 247, and 268. PMG Photo Proof Certificates". stacksbowers.com. Retrieved July 21, 2012. Wikimedia Commons has media related to 2 United States dollar banknotes. USAToday: "$2 bill increasing in use and shedding its 'play-money' image" 2006-11-06. A Demand Note is a type of United States paper money that was issued between August 1861 and April 1862 during the American Civil War in denominations of 5, 10, and 20 US$. Demand Notes were the first issue of paper money by the United States that achieved wide circulation and they are still in circulation today, though they are now extremely rare. The U.S. government placed the Demand Notes into circulation by using them to pay expenses incurred during the Civil War including the salaries of its workers and military personnel. The Australian five-dollar note was first issued on 29 May 1967, fifteen months after the currency was changed from the Australian pound to the Australian dollar on 14 February 1966. It was a new denomination with mauve colouration – the pound system had no £2½ note. A Hawaii overprint note is one of a series of banknotes issued during World War II as an emergency issue after the attack on Pearl Harbor. The intent of the overprints was to easily distinguish US currency captured by Japanese forces in the event of an invasion of Hawaii and render the bills useless. Uncut currency sheets are common numismatics collector's items. They are often sold as souvenirs by issuers. After cutting, usually the banknotes can be used as legal tender; however, the cost to purchase uncut currency sheets is typically higher than the aggregate face value of the cut notes.